The film saw 20 per cent rise on Saturday when it raked in Rs 17.10 crore. Akshay Kumar's Toilet: Ek Prem Katha has become the sixth highest opener of 2017. 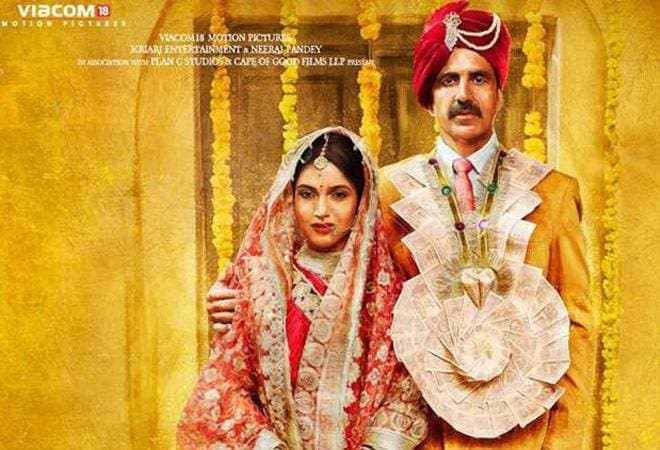 Akshay Kumar and Bhumi Pednekar starrer Toilet: Ek Prem Katha has opened to a decent response from critics and audience. The movie had collected Rs. 13.10 crore on Friday. The film saw 20 per cent rise on Saturday when it raked in Rs 17.10 crore. Akshay Kumar's Toilet: Ek Prem Katha has become the sixth highest opener of 2017. After Salman Khan's Tubelight and Shah Rukh Khan's Jab Harry Met Sejal failed to perform at the box office and impress the audience, Toilet: Ek Prem Katha is expected to break the box office jinx due to its impressive plot line. The movie deals with the issues of sanitation and lack of toilets in the rural parts of India. The theme of the film picks from Prime Minister Narendra Modi's Swachh Bharat Abhiyan. Toilet: Ek Prem Katha was made on a budget of Rs 18 crore. The movie is directed by Shree Narayan Singh and also stars Anupam Kher, Divyendu Sharma and Sudhir Pandey in pivotal roles.